Using mtDNA RFLP Querol et al. (1994) analyzed the population dynamics of Saccharomyces strains during spontaneous wine fermentations They found that despite the high diversity of strains observed at the beginning of the fermentation, very few dominated the process. However, when similarities in the mtDNA restriction pattern of the different S. cerevisiae strains (measured as the proportion of shared restriction fragments) were low, a clear sequential substitution of predominant strains was observed during each fermentation phase. When the similarity was high, even though a sequential substitution could also be observed between secondary strains, a clearly predominant strain was present during the whole fermentation process. Figure 2 Molecular methods to yeast characterization: intron splice sites, 8 sequences, microsatellites and RAPD. 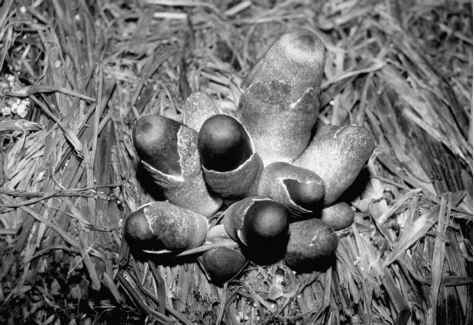 On the basis of chromosomal profiles, Frezier and Dubourdieu (1992) found that a small number of S. cerevisiae strains were capable of dominating fermentations in the same winery over two vintages, independently of the grapevine cultivar. Vezinhet et al. (1992) investigated using mtDNA analysis and electrophoretic karyotyping the evolution of S. cerevisiae strains isolated during six consecutive years in the cellars of two vineyards. They concluded that the wide distribution of some strains in the areas studied and their presence over a number of years constituted evidence for the occurrence of specific native strains representative of a particular wine region. Schiitz and Gafner (1994) proposed that the composition of yeast strain populations differs from must to must and from year to year. However, they also found strains isolated from two grape musts and from two vintages that presented very similar chromosome patterns to the commercial strain W27 (Lallemand) isolated from the same region. Figure 3 Hinfl mtDNA restriction patterns of commercial wine yeast strains analyzed in Ferniindez-Espinar et al. (2001). Guillamon et al. 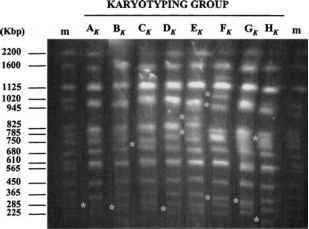 (1996) have analyzed the correlation between genetic distance and ecological/geographical factors using mtDNA restriction analysis and electrophoretic karyotyping. This constitutes the first survey to investigate molecular variation among natural strains from different wine regions. They found significant correlation between both ecological factors (e.g., grape varieties) and/or geographical origin and the molecular relationships among strains. The analysis of genetic variation in natural years populations often results in the determination of the particular biological factors that influence population structure, hence population variations within and between wine regions have to be characterized to elucidate those factors that determine the distribution of variations in natural populations of S. cerevisiae.